The holidays just ended and we are now here to welcome another year. But with or without a reason to celebrate, it would be nice to make something yummy for the kids. Although it would be easier to do it when you just buy one but it would be more rewarding on your part as a mom if you make things on your own. Also, your kids will love it that you are making something special for them. If you have limited time, this No-Bake Chocolate Cake will be a good choice for you. And the ingredients are easy to find. Also, it is very affordable. You can make it anytime you want! Super easy, right? You can even make this with the help of your kids without getting messy. For sure they would love to help. You can also experiment with different flavors as well. I actually think that nothing will fail with cream and condensed milk together. 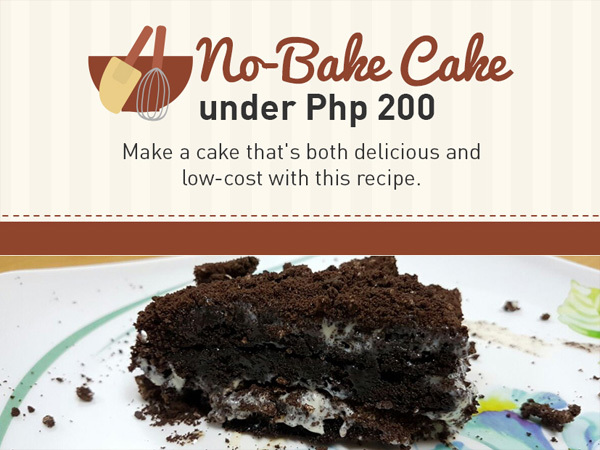 This easy No-Bake Cake is an idea from MoneyMax PH. I have never thought of this! I only do Graham Cakes because I though that's the only No-Bake cake I know. Haha! Maybe mixing come coffee to the cream would be great if making cake for adults? Haha! This is a good idea! I am into a "no cook" and "no bake" finds these days and then I caught this! Thanks for sharing. Let me try this at home.